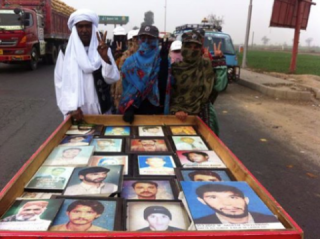 The Voice for Baloch Missing Persons, VBMP, is a campaign that is trying to collect information and publicise the cases of abducted Baloch activists and the extra-judicial killing of Baloch people. To publicise their cause, relatives of the missing and the dead are marching from Quetta, through the hills of Baluchistan to the coast at Karachi before crossing the vast province of Sindh to the Punjab. So far, they have walked some 2,100 kilometres and have arrived in Lahore with still another 350 kilometres before they reach their destination, the capital Islamabad. The march is led by Mama Abdul Qadeer Baloch, an old man in his 70s, and Banuk Farzana Majeed and other brave young women and men and is the longest political campaign march in Pakistan's history. The central demands of the march are for the release of the 18,400 missing people or of the bodies of those killed after abduction and an end to all military operations in Baluchistan. This Long March has angered the state because this small group of Balochi have highlighted the case of Baluchistan across the whole of the country and especially now in Punjab, the home province of the ruling elite of Pakistan. Their refusal to be silenced has made the establishment nervous and they are making threats and intimidation against the marchers. For example, on February 8, two marchers, Shahshan Baloch and Irfan Ali, a member of the Communist Mazdoor Kissan Party, were injured when a truck ploughed into them – and this was later explained away as a result of brake failure. The same tactics are being used against those who have the courage to host the marchers, or even to greet them, in the towns along their route. In Lahore, death threats have been made against members of the Awami Workers' Party who organised support for the Long March on its arrival. Now, Mama has been told to expect “the worst consequences” if the march sets off for Islamabad. Caravan leader Mama himself received the mutilated body of his son who was the information secretary of the Baloch Republican Party, Jalil Reiki, in November 2011. The courageous Banuk Farzana Majeed is a sister of Zakir Majeed a student leader who has been missing since 2009. The rest of the small group consists of other women and children whose brothers, fathers and husbands are “guilty” of struggling for their rights and standing up against the state. Baloch are systematically being marginalised to make their suppression easier and the exploitation of their resources justifiable. On January 25, a shepherd discovered a mass grave in Tootak, Khuzdar District after which the locals converged there to recover bodies. According to the “progressive and nationalist” government representatives, 13 bodies were found, while the Asian Human Rights Commission has counted 103 dead bodies recovered from the graves. Local people say the body count is 169 and believe there are more graves in the area but the security forces have cordoned off the area and are not allowing anyone to go there. The Long March has become even more important with the discovery of the mass graves. The participants’ determination is strengthened even more with this horrific discovery. Their march is an entirely new dawn in the struggle of the Baloch people and other oppressed and working class people for their rights and against the injustices of capitalism and the state. The newly imposed law, the Protection of Pakistan Ordinance (PPO) simply illustrates, and legalises, the policy of repression that has been enforced. PPO gives legal cover to enforced disappearances by removing the legal requirement to produce detainees before a court of law within 48 hours of arrest, and extends this period to 90 days. The “War on Terror” is used to justify destruction and state operations in Baluchistan. Musharraf launched military operations in 2005 and the governments of the Pakistan People's Party and now of Nawaz continued them. Their current offensives in the Panjgur, Khuzdar and Mastung districts of Balochistan began after an attack on Hazara Shia in Mastung; the responsibility for which was claimed by Lashkar-e-Jhangvi (LeJ). Yet, the military operations are being conducted against the strongholds of the Baloch national movement, not the networks of Lashkar-e-Jhangvi. Baloch men, women and children were arrested, tortured and killed by these ongoing operations against anyone suspected of sympathising with the Baloch national cause. What is clear is that the state is using the environment of fear to justify operations in Khyber Pakhtoonkhwa and in Balochistan that will bring nothing but hatred, racism, war mongering and the displacement of population and ultimately encourage terrorism. Many on the left welcomed the appointment of Dr Malik (left nationalist and pro-federation) as chief minister of Baluchistan and said it was a wise decision of the Nawaz Government. They hoped that he would solve the real demands of the people such as the missing person issue, the end of military operation and the building of the industrial and social infrastructure. What has actually happened is that the National Party has capitulated and made it easier for the state to crush the movement. After all, as the Chief Minister of Baluchistan, Dr Malik is supposedly supervising all military operations. The important question now is what should be the attitude of revolutionary socialists in the current situation. The Baloch national movement is an important question of class struggle in Pakistan. First of all, we should support the Long March and the demands for the release of missing person and an end to military operations and try to spread it in the working class and youth in all provinces of Pakistan. We must also oppose the PPO and build a movement against it. This is a law that will not only be used against the Balochi but also on issues related to the “War on Terror” and against the working class who are facing tremendous hardship in Pakistan. We support the right of national self-determination unconditionally, but critically. Lenin wrote that support for the self-determination of oppressed peoples by the workers of the oppressor nation creates better conditions for working class struggle. Instead of the workers of the different nations fighting each other, they can unite to fight against capitalism. We want a voluntary federation of nations, not a forced one. We want to abolish borders and boundaries instead of creating them. National self-determination (including the right of oppressed nations to form their own states, if they wish) has to be understood as a step towards this unity. It increases the forces of socialist revolution. Why? Because the workers and all progressive forces of the oppressor nation and state can only win the trust of the oppressed if they support their rights without hesitation. The achievement of self-determination, with the support of the workers and peasants of the former oppressor nation, is the best way to weaken reactionary forces in both nations. It would create the best situation in which to fight the exploitative classes in both nations. As soon as the system of class exploitation is overcome, the basis for the exploitation of one nation by other nations will be overcome, too. In these circumstances, revolutionary socialists should support the Balochi national movement. At the same time, we must also point out the class differences within the national liberation movement and the dangerous misleadership of bourgeois forces. We need to fight for the working class and socialist forces to become the leadership of the national liberation movement. The working class needs to build its own organs of struggle that will link their struggles with those of the whole Pakistani working class, indeed with workers worldwide. The working class movement would use the methods of class struggle; strikes, occupations, the general strike, culminating in a mass political uprising. In this way, the national liberation of Balochistan and the struggle for socialism can go forward.